The new LREC9252PF-2SFP builds on LR-LINK’s history of excellence. 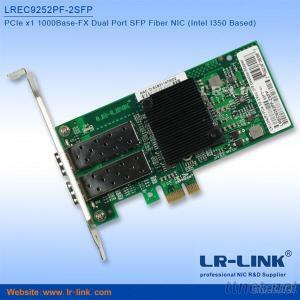 LR-LINK continues its market leadership with this new generation of PCIe* GbE network adapters. Built with the bridgeless Intel® Ethernet Controller I350, these adapters represent the next step in the Gigabit Ethernet (GbE) networking evolution for the enterprise and data center by introducing new levels of performance through industry-leading enhancements for both virtualized and iSCSI Unified Networking environments. This new family of adapters also includes new power management technologies such as Energy Efficient Ethernet (EEE) and DMA Coalescing (DMAC).